Even as the ruling NDA government has been charging the opposition, especially Congress, for seeking to roadblock implementation of the Goods and Services Tax (GST) across India, facts suggest, Narendra Modi as Gujarat chief minister, and later his successor, Anandiben Patel, taken strong exception GST till December 2014.
that the implementation of GST would cause severe loss to a manufacturing state like and affect the ‘Make-in-India programme’. It stated, the new draft of the 122nd Constitutional Amendment Bill from the empowered committee failed to address “many of the concerns raised by the states have not been reflected in the draft”, adding, the states would “lose their fiscal autonomy”, in the same way as it happened after the introduction of the value added tax (VAT) in the place of sales tax. 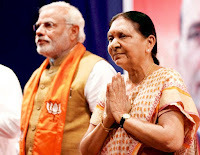 This was a continuation of what Narendra Modi as Gujarat chief minister had been saying between 2007 and 2014 to numerous empowered committee meetings of state finance ministers. In each of them, the state government opposed the constitutional amendment comprising GST Bill, describing it as against “the federal spirit of Constitution” as also the “rights of states to fiscal autonomy”.